Sitting on the floor, with her suitcase in front of her, 100-year-old Kim Yu-jung is preparing for a remarkable journey. Surrounded by four of her children, the youngest of them now in his late 50s, she is packing some winter clothes for the colder weather in the North. The family is one of a small number given a rare chance to meet their long-lost relatives from the other side of the border that cuts this peninsula, and the lives of its people, in half. 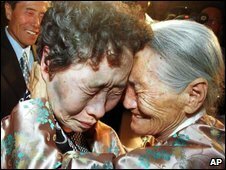 Mrs Kim is going to meet the daughter she last saw more than half a century ago. 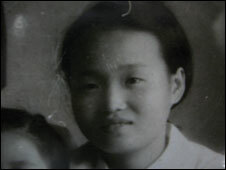 Lee Hye-gyong, then just 16 years old, was separated from her family in the chaos of war, and ended up living in the north. Her photo, taken just a year before the outbreak of the Korean War, shows a young schoolgirl unaware of the unimaginable tragedy shortly to befall her country and her family. “I have thought about her for more than half a century,” Mrs Kim tells me. For six days, from 26 September, 200 families, half from the North and half from the South, will travel to a mountain resort in North Korea for their reunions. Their names have been selected at random from the tens of thousands on the waiting list. In the early part of this decade the meetings were held regularly and, caught on television cameras, they are a powerful reminder of the continuing humanitarian cost of Korea’s division. Fathers and mothers cling to lost sons and daughters, husbands to wives, and sob uncontrollably, grieving for the more than five decades of lost time. The programme is not without its critics, who say it allows North Korea to play politics with people’s lives by deciding when they will, or will not, take place. Professor Chung Min Lee, a foreign policy adviser to the current South Korean president, says political problems may have curtailed the programme’s scope. “In the past North Korea has agreed that it would institutionalise these reunions, but whenever an obstacle arises – for example the UN imposes sanctions because they have tested a nuclear weapon – then the whole issue gets sidelined,” he tells me. The last reunion took place back in 2007 as tensions between North and South began to rise. The fact that this latest round is being allowed to take place is being seen by some as a sign that North Korea is ready again to build bridges with the South. But no date has yet been set for the next one and many humanitarian issues remain unresolved. The South wants to know the status of 500 of its citizens, mostly fishermen, who it believes were seized by the North in the decades following the war, and never returned. The South also believes that hundreds of its prisoners of war still remain alive in the North. But Pyongyang refuses to discuss the issue, claiming that they have all voluntarily defected from the South. 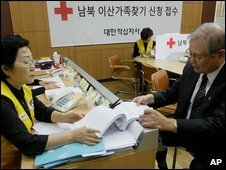 The list of those seeking a reunion is maintained by Red Cross officials on either side of the border. In a downstairs room in the organisation’s Seoul office a team of volunteers waits to register new applicants. 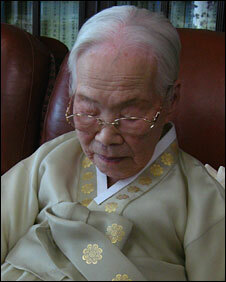 Yeo Kwan-soo last saw his pregnant wife and seven-year-old son in 1951. At the age of 85 he is only now putting his name on the database. “After our wartime separation I thought about my family back in the North all the time,” he tells me. Although 100-year-old Mrs Kim is one of the lucky ones, the reunions themselves are far from easy. The families are allowed to spend time together and share meals, but once the visit is over they return home, knowing it is highly unlikely they will see each other again. I ask her family if they think it will be hard for her to leave her daughter in North Korea for a second time. “Her life has been like a time capsule of modern Korean history,” one of them tells me.